This has been a challenging year for our communities and our country. Immigrant communities, communities of color and LGBTQ people have been under attack led by the growing xenophobic leadership in our country. 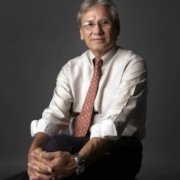 And if that is not enough, the problems of tobacco and unhealthy eating have increased in many of our Asian American and Pacific Islander communities. We, at APPEAL, believe that these injustices against our communities require a strategic, comprehensive approach that builds community power and community leadership especially among the younger generation. 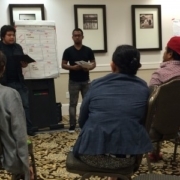 For nearly 25 years, APPEAL has helped to build community leadership and power to help fight injustices through a nationally-renowned community leadership program resulting in the training of over 1,100 leaders and advocates in the U.S. and the Pacific. Asian Pacific Partners for Empowerment, Advocacy and Leadership (APPEAL) is a national non-profit health justice organization dedicated to eliminating tobacco use and obesity in the Asian American, Native Hawaiian and Pacific Islander (AANHPI) communities and other communities of color through public health education and advocacy. 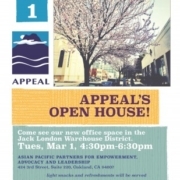 We hope that you will join us in supporting APPEAL’s important leadership development work by making a donation of $500 or more. If you would like to make a donation, please click here. This will help us launch our “Youth for Equity and Justice” leadership initiative for 10 young adult leaders in 2018. We have raised $6,500 so far out of our goal of $10,000. Thank you to those of you who have generously donated to this campaign. 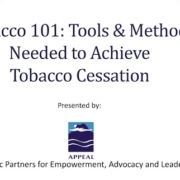 APPEAL’s leadership model has been the pillar of our movement on tobacco control and healthy eating and active living. By training and nurturing local leaders, APPEAL is ensuring the sustainability of advocates who can organize their communities to address critical health justice issues. 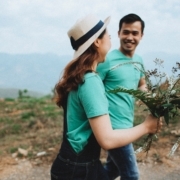 Your contribution is an investment in the long-term health and well-being of Asian American, Native Hawaiian and Pacific Islander communities. Now more than ever we need you to consider a contribution to ensure continued progress in 2018. Your generous and timely contribution is greatly appreciated. Thhank you to our presenters and to all those who participated in the webinar! For those who missed the webinar, a recorded version is available here. 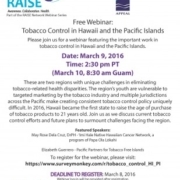 Please join us for an important webinar featuring the tobacco control work underway in Hawaii and the Pacific Islands. 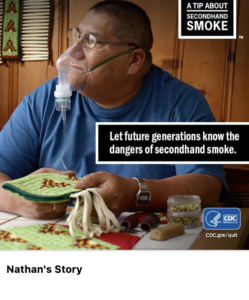 These are two regions with unique challenges in eliminating tobacco-related health disparities. 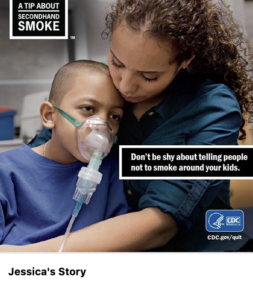 The region’s youth are vulnerable to targeted marketing by the tobacco industry and multiple jurisdictions across the Pacific make creating consistent tobacco control policy uniquely difficult. In 2015, Hawaii became the first state to raise the age of purchase of tobacco products to 21 years old. 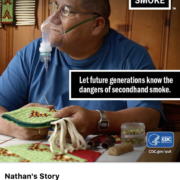 Join us as we discuss current tobacco control efforts and future plans to surmount challenges facing the region. A passionate and dedicated group from Southern California’s vibrant Asian American, Native Hawaiian, and Pacific Islander (AANHPI) communities gathered recently to hone their leadership skills at a training session conducted by Asian Pacific Partners for Empowerment, Advocacy, and Leadership (APPEAL). Representatives from Southern California-based AANHPI organizations, Guam Communications Network (CGN), Families In Good Health (FIGH), and Empowering Pacific Islander Communities (EPIC), participated in the leadership development event, Aug. 14-15, under the auspices of APPEAL’s Community-lead Policies and Leadership to Eliminate Disparities for Asian Americans and Pacific Islanders on Tobacco (Com-PLEAT) Program. Community-Based Participatory Research (CBPR) is the main focus of the ComPLEAT Program, but leadership development is also a key element intended to provide vulnerable communities with the skills needed to participate in research as equal partners, as well as the skills needed to lead their communities in campaigns aimed at addressing health disparities. The August training sessions were designed to increase tobacco control leadership knowledge and skills among community advocates for Native Hawaiian, Pacific Islander, and Cambodian communities including current tobacco issues, coalition building and policy skills, as well as to help community partners prepare for and present on their policy change projects. 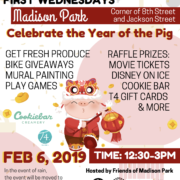 EPIC and GCN’s campaigns focus on smoke-free multiunit housing and community smoke-free policies, while FIGH’s campaign focuses on smoke-free skate parks. 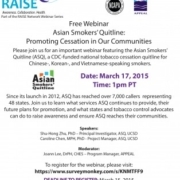 Join us for a RAISE Network webinar hosted by APPEAL and the National Council of Asian Pacific Americans (NCAPA) featuring the Asian Smokers’ Quitline (ASQ), a CDC-funded national tobacco cessation quitline for Chinese-, Korean-, and Vietnamese-speaking smokers. Since its launch in 2012, ASQ has reached over 7,000 callers representing 48 states. 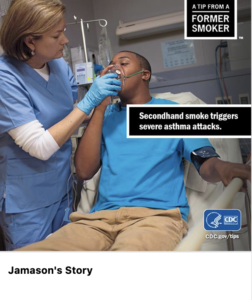 Join us to learn what services ASQ continues to provide, their future plans for promotion, and what states and tobacco control advocates can do to raise awareness and ensure ASQ reaches their communities. Dolores Clara Fernandez was born on April 10, 1930 in Dawson, a small mining town in the mountains of northern New Mexico. Her father Juan Ferånández, a farm worker and miner by trade, was a union activist who ran for political office and won a seat in the New Mexico legislature in 1938. Dolores spent most of her childhood and early adult life in Stockton, California where she and her two brothers moved with their mother, following her parents’ divorce. Alicia’s community activism was reflected in Dolores’ involvement as a student at Stockton High School. She was active in numerous school clubs, was a majorette, and a dedicated member of the Girl Scouts until the age of 18. Upon graduating Dolores continued her education at the University of Pacific’s Delta College in Stockton earning a provisional teaching credential. During this time she married Ralph Head and had two daughters, Celeste and Lori. While teaching she could no longer bear to see her students come to school with empty stomachs and bare feet, and thus began her lifelong journey of working to correct economic injustice. While the farm workers lacked financial capitol they were able to wield significant economic power through hugely successful boycotts at the ballot box with grassroots campaigning. As the principal legislative advocate, Dolores became one of the UFW’s most visible spokespersons. Robert F. Kennedy acknowledged her help in winning the 1968 California Democratic Presidential Primary moments before he was shot in Los Angeles. Throughout the years she has worked to elect numerous candidates including President Clinton, Congressman Ron Dellums, Governor Jerry Brown, Congresswoman Hilda Solis and Hillary Clinton. As much as she was Cesar’s right hand she could also be the greatest thorn in his side. The two were infamous for their blow out arguments an element that was a natural part of their working relationship. Dolores viewed this as a healthy and necessary part of the growth process of any worthwhile collaboration. While Dolores was busy breaking down one gender barrier after another, she was seemingly unaware of the tremendous impact she was having on, not only farm worker woman but also young women everywhere. While directing the first National Boycott of California Table Grapes out of New York she came into contact with Gloria Steinem and the burgeoning feminist movement who rallied behind the cause. Quickly she realized they shared much in common. Having found a supportive voice with other feminists, Dolores consciously began to challenge gender discrimination within the farm workers’ movement. Early on, Dolores advocated for the entire family’s participation in the movement. After all it was men, women and children together out in the fields picking, thinning and hoeing. Thus the practice of non-violence was not only a philosophy but a very necessary approach in providing for the safety of all. Her life and the safety of those around her were in jeopardy on countless occasions. The greatest sacrifice to the movement was made by five martyrs all of whom she knew personally. At age 58 Dolores suffered a life-threatening assault while protesting against the policies of then presidential candidate George Bush in San Francisco. A baton-wielding officer broke four ribs and shattered her spleen. Public outrage resulted in the San Francisco Police Department changing its policies regarding crowd control and police discipline and Dolores was awarded an out of court settlement. At 84, Dolores Huerta continues to work tirelessly developing leaders and advocating for the working poor, women, and children. 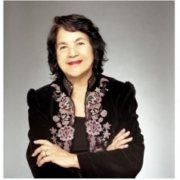 As founder and president of the Dolores Huerta Foundation, she travels across the country engaging in campaigns and influencing legislation that supports equality and defends civil rights. She often speaks to students and organizations about issues of social justice and public policy. There are thousands of working poor immigrants in the agriculture rich San Joaquin Valley of California. They are unfamiliar with laws or agencies that can protect them or benefits that they are entitled to. They are often preyed upon by unscrupulous individuals who take advantage of them. They often feel hopeless and unable to remedy their situations. Dolores teaches these individuals that they have personal power that needs to be coupled with responsibility and cooperation to create the changes needed to improve their lives. There are four elementary schools in California, one in Fort Worth, Texas, and a high school in Pueblo, Colorado named after Dolores Huerta. She was inducted into the California Hall of Fame in March of 2013. She has received numerous awards: among them The Eleanor Roosevelt Humans Rights Award from President Clinton in l998, Ms. Magazine’s One of the Three Most Important Women of l997, Ladies Home Journal’s 100 Most Important Woman of the 20th Century, The Puffin Foundation’s Award for Creative Citizenship: Labor Leader Award 1984, The Kern County Woman of The Year Award from the California State Legislature, The Ohtli Award from the Mexican Government, The Smithsonian Institution – James Smithson Award, and Nine Honorary Doctorates from Universities throughout the United States.